Cofound.it is a crowdfunding platform that helps to connect blockchain focused startups, and entrepreneurs with a team of carefully selected investors and blockchain experts, who are well-trained and have all it takes to run a serious blockchain business. Cofound.it was mainly built to help develop a more convenient and accessible venture capitalist ecosystem based on crowdfunding. However, the platform has disintegrated into the complete opposite of its core mission. The current general consensus when it comes to the cryptocurrency market is that the market will turn around soon enough. The team behind Cofound.it is not followers of this school of thought. They made this clear in their recent announcement regarding the closure of the Cofound.it services and their plan to distribute the assets amongst numerous nodes (CFI tokens holders). The team also made it clear that they believe the ICO community has become “compromised and exploitable”. This makes getting the right kind of help and funding for floats for truly worthy startups and entrepreneurs very difficult. Having the wrong type of community was not helping matters either. As a result of this, they believe that helping projects to launch ICOs is not the right thing to do. What does the closure of Cofound.it mean for ICOs? 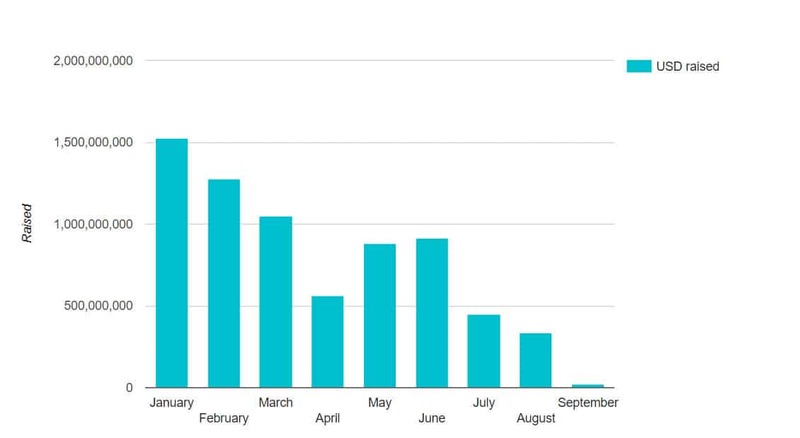 Overall, the month-to-month total of ICOs funds raised in 2018 has been decreasing over time. However, Cofound.it has made it known that the current state of technology is not in line with the many promises made by most ICO projects. This has led to millions of people having high expectations. Since further “unachievable” promises are being made by the vast majority of ICOs, this trend of raising false-hope is expected to continue. This clearly shows that the user community is suffering the most, especially in terms of investment loss. Recently several governments, such as France, have been looking into ensuring proper regulation of various ICO’s operations within their borders. The ICO industry is likely to recover, but this is probably going to take an extended period. What Does The Future Hold For CFI Holders? As of writing these words, Cofound.it developers have stopped token trading among exchanges such as Bittrex, which had the highest daily trading volume of CFI tokens. Cofound.it has said that its assets will be distributed amongst its CFI token holders. Cofound.it also said that further information on this will be published on their social channels.